You can import bitmap images as vector drawings, which allows you to edit them using Harmony's vector drawing tools. This is especially useful to convert bitmap line art scanned or created in a different software into vector line art so it can be painted in Harmony. 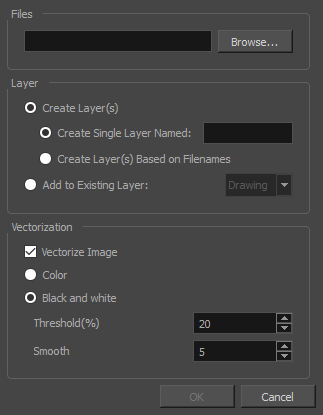 In the Vectorization section, select the Vectorize Image option. ‣ Colour: Imports bitmaps as vector objects with their image as a texture. ‣ Black and White: Vectorizes drawings with a solid black line. This creates a 100% vector-based drawing and paints it with the Vectorized Line colour swatch from your scene's palette. Determines what values in the scanned image will be considered as part of the drawing, and what will be ignored and eliminated in the vectorized drawing. The lower the value, the darker the image and vice versa. Determines how smooth the lines will be. The lower the value, the more detail will be retained. The higher the value, the more polished and easy to edit the lines will be.